St. Patrick's is now a basilica. 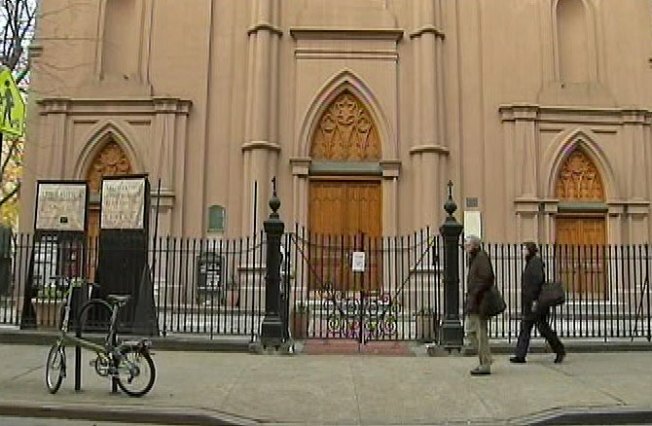 A 200-year-old Catholic Church in Manhattan is making history. Old St. Patrick's Cathedral in Little Italy today became a basilica on order of Pope Benedict, making it the first in the archdiocese of New York City. Old St. Pat's, which was begun in 1809, has a storied history in Little Italy. It was the original home of the New York Archdiocese -- a fact the church's monsignor likes to remind its uptown neighbor -- the other St. Patrick's. "They may be the heart of Manhattan but we consider ourselves the soul of Manhattan," said Monsignor Donald Sakano. Old St. Patrick's was the site of a memorial service after the death of John F. Kennedy Jr. The church also had its turn on the big screen. The baptism scene from The Godfather was shot in the sanctuary. Hundreds of people were buried in the crypt and the structure's walls were originally built o protect the church during nativist riots in the 19th Century. Now, millions of dollars are being spent to restore the old look. A Basilica is the term used for the most important ancient houses of worship of Rome. The pontiff sometimes extends the designation to churches of importance in their own cities.